Allergies. It’s time to start banning food at school. When one mum said that the school should not allow certain foods because her child was allergic, what an outrageous claim! “banning of certain foods and not allowing parents to bring home made treats for kinder birthdays”. I want to share my response because sometimes allergy parents get a bad wrap for ‘inconvenience’ to kids who can eat everything. As a mother of an anaphylactic child I can honestly say that I DON’T AGREE that there should be a ban on foods in school. However in saying that, I do believe there should be respect and education of others for the safety of a child who has a life threatening food allergy. 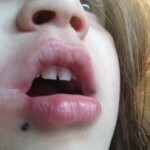 My 7yo has been allergic since before solids. She is allergic to nuts, dairy, eggs, shellfish and sesame. If she consumes even trace amounts of an allergen, she could die. When kids are young and allergic it’s very hard to keep them safe. How many 2yr olds do you know that are clean eaters? How many 3yr olds actually sit down at a table to eat? If there is food in these situations that can’t be controlled by a parent, the risk to the child is heightened. 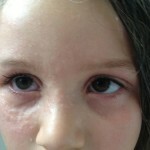 My daughter is so allergic that if she touches a surface that has had an allergen on it, she will get a rash. 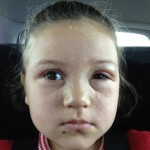 So to imagine her body having to cope with all the foods she’s allergic to at once would be scary! In the case of kindergarten, yes it’s hard for the teachers but it’s so common these days. I provided safe cupcakes for my child in the kinder freezer for birthdays so she would feel included. But if a parent brought in a cake with buttercream icing or a pavlova, I’d be very uncomfortable. Why? Who’s going to be diligent enough to wash each child’s hands and faces, properly clean all surfaces? And the yummy pav, the egg white fine particles airborne and breathed in by an allergy kid could be there last. The fact is we live in the world. We walk past the nut shop, my other kids have milk and eggs. But in my own home I can ensure that I wash my kids hands and faces. I make sure to clean all surfaces where an allergen has been. I can’t be everywhere so I rely on my child’s teacher to keep them safe, keep them alive. Do you know and have understanding of allergy kids? What life is like for them and their families, please ask. There is so much we can learn from each other.